Jana Marie Raak was born on June 26, 2013 at 10:47pm. She was 10 days early, born naturally and without complications. 7lbs, 10oz and 20in long. My husband and I were beyond ecstatic, our first born! Throughout our joyous first month we noticed that her left eye was open more than her right eye. She also looked to have a slight bump over her right eye. We thought it might have been from her trip down the birth canal, but since we were new parents, we questioned it at Jana’s 1 month appointment. Our pediatrician didn’t think it was serious, but sent us to have an MRI done. The pediatrician called me that night asking me to come in for a follow-up appointment. 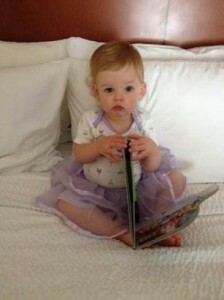 She confirmed the next day that Jana had left coronal craniosynostosis. She walked us through some diagrams and showed us some pictures and already had an appointment set up for us with a neurosurgeon that following Monday. I’d be lying if I told you I took any of this news well. Here she was, our perfect 4 week old baby, with a condition I couldn’t even pronounce at the time. How could this be? 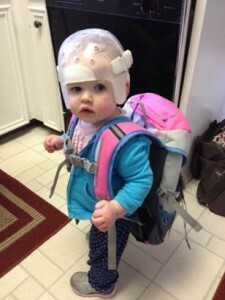 We met with the neurosurgeon Monday, August 5, 2013 and he told us our options: We could wait and do an invasive cranial vault remodel when she was older (9 months+). Or that he could perform an endoscopic surgery: a less invasive procedure, that required a small cut of the skull, paired with a year of helmet therapy. Being that she was so young and was going to grow so much over the next year, we debated, but decided that ultimately the sooner, the better. Her surgery was scheduled for August 12, 2013 at Helen DeVos Children’s Hospital in Grand Rapids, MI, only a week after meeting with the neurosurgeon and just shy of Jana being a complete 6 weeks old. Giving my baby girl up to the nurses that day, was probably the hardest thing I ever experienced (including the 2.5 hour wait while she was in surgery!) Luckily, surgery went extremely well and after only one night in the hospital we were able to take Jana home. 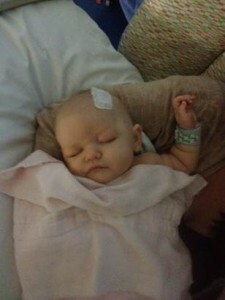 Jana remained in good spirits and had no trouble eating or sleeping after the surgery. All she had was a little wound closure strip over the spot where they operated and a small amount of swelling. Barely noticeable. 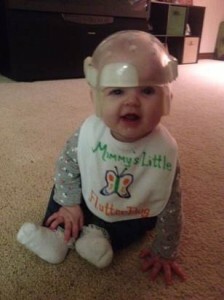 The next week we met with the helmet specialist and Jana was fitted for her first helmet. 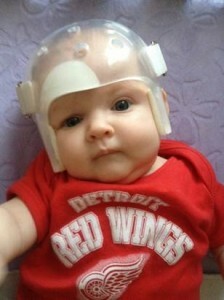 I was skeptical at first how a baby would do in a helmet, but Jana adjusted very well to wearing the helmet and it never seemed to hinder her progress. Our baby girl was on the road to recovery! Jana spent the next 11 months in a helmet for 23 hours a day (4 helmets total that grew as she grew.) Every check-up that she went to and every new helmet brought her closer to “normal.” On July 14th we received word that our helmet reconstruction was complete and Jana was now able to be “helmet free.” Her progress made was remarkable. I believe that catching it early on and being proactive at figuring out a solution is what helped most. We are so thankful for our pediatrician: that sent a 4 week old baby to get an MRI, our neurosurgeon: who ensured us our angel was in good hands and our orthotist: who fitted and worked with our daughter’s head numerous times. They all played an important role in Jana’s success. We are forever in your debt!